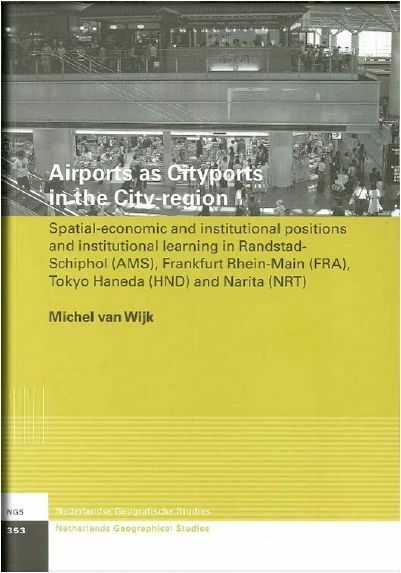 Spatial-economic and institutional positions and institutional learning in Randstad Schiphol (AMS), Frankfurt Rhein-Main (FRA), Tokyo Haneda (HND) and Narita (NRT). A growing number of airports are developing as major cityports within their respective cityregions, yet literature related to the spatial-economic and institutional position of these airports is rare. By looking into three detailed case studies in the Netherlands, Germany and Japan, Michel Van Wijk provides many new fascinating insights about this topic. In the Netherlands, the parties that determine the future of the national hub Schiphol Airport have been wrestling for decades with the dilemma that growth means more noise pollution, at least in the short term. In a new effort to reconcile the irreconcilable, the Dutch Cabinet asked former minister Hans Alders to devise a plan for making future controlled growth of the airport possible, and to do this in co-operation with interested parties such as the airport and inhabitants of the surrounding municipalities. Last October, this ‘Alders-table’ delivered its report. Highlights are that Schiphol should be allowed to grow to 510.000 aircraft movements in 2020 (430.000 in 2007) and that the present legally set noise control instruments be replaced by a constellation of agreements between the airports and the people living around it. Selectivity in combination with the introduction of a multi airport system has become a topic for future policymaking around Amsterdam Airport Schiphol (AAS). Veldman enumerates several demand management measures like slot allocation and slot trading, pricing (charging and taxing), restrictions (limit traffic volumes or aircraft types), multi airport system (MAS, redistribution or outplacement of flights) and selectivity (changing the mix of flights). Selectivity as an instrument of direct demand management changes the mix of traffic and operations at an airport in a robust way. Long term growth of Schiphol in support of the mainport objective can be safeguarded with this new selectivity policy.